Jennifer Williams looks at how continuous fl ow hot water delivery systems are fast overtaking the old technology of heating and storing water ready use. Reports from the market on hot water heating system delivery in the commercial sector are showing a transition away from older technologies, which commonly use large volumes of cylinder stored and reheated hot water, are reaching a ‘tipping point’ with continuous fl ow units vastly out-perform them in terms of capital costing, economy of fuel, plant room space and lifetime efficiency. Each family is said to use 80 litres of hot water daily and the older technologies employed by traditional means of stored hot water heating systems are increasingly unable to economically and sustainably meet these market demands. Stored types of systems feature an insulated cylinder or container that keeps large quantities of water heated by either a boiler or immersion heater, and reheated when temperatures drop below a useable temperature. Thus, when there is demand, stored water is released and used, and then the cylinder refi lled and reheated to remain at optimum temperatures (above 60°C) until next use. The market today requires and expects instant access to hot water, and in most domestic and light commercial applications there is no need for an inefficient system that can have a significant lag in recovery time to fully reheated water reserves. The major claimed benefits of storage systems lie in large commercial applications, such as a gyms or hotels, which need very large volumes of water at peak times – however, this can be easily accommodated by using a cascade system of continuous fl ow units. According to an AECOM independent study (AECOM is the largest building services consultancy in the world) the life cycle costings of continuous fl ow systems in comparison to equivalent storage systems, on average a ‘continuous flow water heating system can be up to 7% more economical.’ At 89% efficiency on average, a storage system will encounter heat loss and wasted energy – reheating at times when there is no demand, for example. A continuous fl ow unit will maintain an efficiency level of 96%, increasing the returns on investment; or in other words, major savings on ongoing costs. Continuous flow hot water delivery is disrupting the old ways with new ways of doing it better, faster and more economically. The continuous fl ow units and systems offer heating efficiency, reliability, space saving, Legionella prevention and environmentally conscious Low NoX outputs – plus a Limescale Check system which ensures optimum performance throughout the life of the unit by constant monitoring and alerts for any buildup of lime-scale residue. Limescale can build exponentially if left and ignored, where a 1.6mm depth of limescale on a heat exchanger means a drop in efficiency of at least 12% – and a cut in the efficiency of any system means higher running costs. 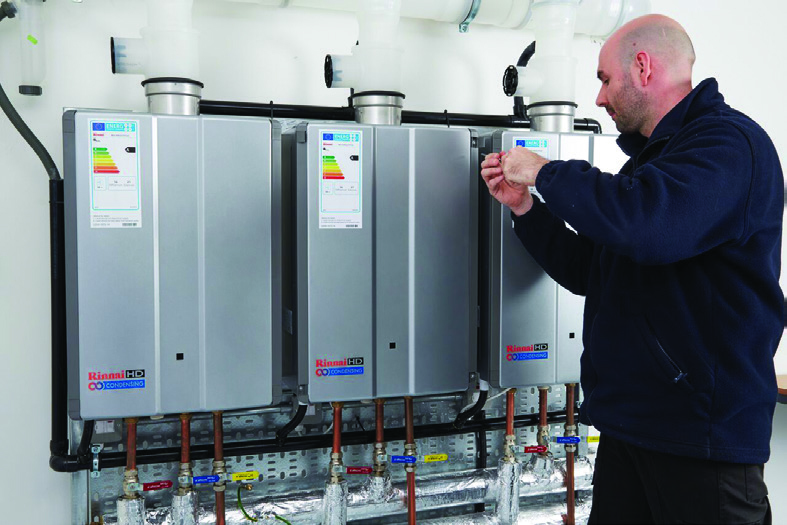 ‘The payback investment over the 10 years-plus life of a single Rinnai unit can be measured and shown to out-perform cheaper and much less efficient water heaters in a matter of months,’ adds Chris Goggin, Operations Director.